A double side-by-side art treat! 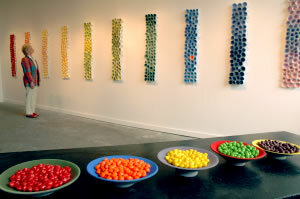 The Kolva - Sullivan Gallery, housed in a great industrial warehouse space, features monthly revolving shows by regional artists. 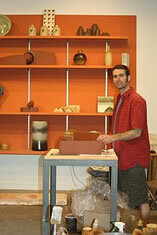 Many months there is a ceramics emphasis and new work by up and coming ceramic artitsts from the Archie Bray Foundation. 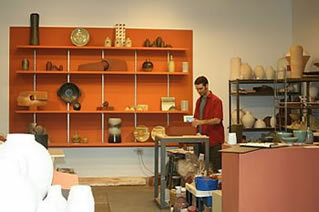 The Archie Bray Foundation for the Ceramic Arts is a ceramics and clay educational institution outside of Helena, MT. 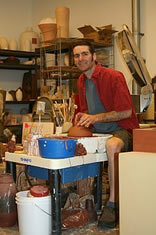 Its primary mission is to provide an environment that stimulates creative work in ceramics and it "graduates" some of the best ceramic artists working in the US today. 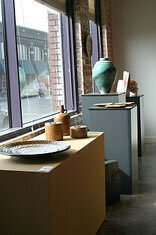 Trackside Studio shares the adjoining space and shows contemporary ceramics produced on- the-spot by two potters. 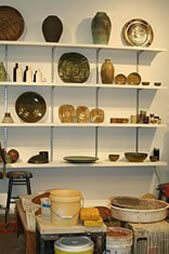 A complete working studio is set up behind the gallery in front and is complete with wheels, kilns and happily working potters. 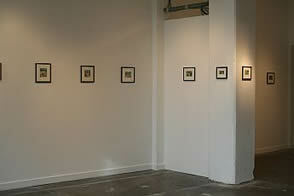 New work is constatly being produced and available for sale. 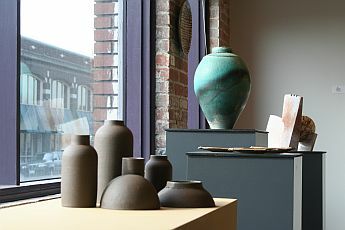 Both galleries join together for showings of new work once a month with the opening on First Friday, Spokane's own first Friday of every month art celebration.